As the next-generation workforce moves more mobile, their expectations are for fast, easy and direct interactions. Companies in turn, need faster ways to acquire, engage, filter and rapidly hire quality talent. Findly is built for the next-generation mobile work-force, it’s automated, it’s self-sustaining: it helps identify quality candidates, so companies can access the right person when they need them. Most employers are coming to understand that the age-old, post-and-pray advertising tactics aren’t working, and many are venturing into a more progressive approach: Recruitment marketing. Fundamental challenges to this approach include defining key performance indicators and how to measure success. 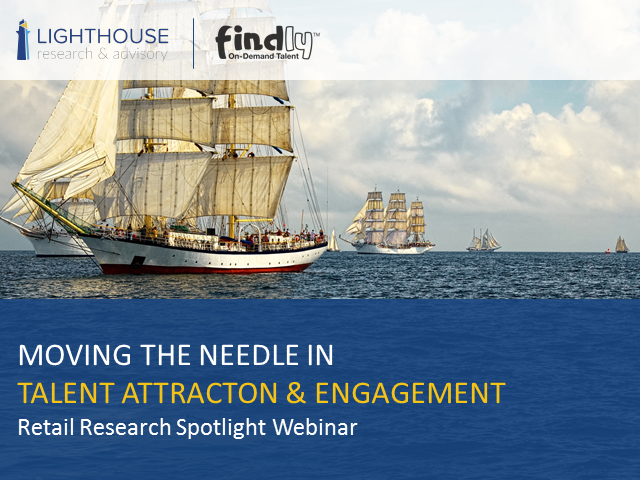 According to the latest findings from Lighthouse Research & Advisory’s benchmark survey, Modern Measures of Success in Talent Acquisition, 78% of companies say that measuring performance in Talent Attraction and Engagement is important or critically important. The only problem (and it’s a big one) is that 45% of companies are relying on inconsistent, or anecdotal data. Among retail employers, 38% aren’t tracking performance data at all. Register today and as a thank you we will send you complimentary report including a summary of key findings from the research post webinar. Organizations spend a lot of time, effort and resources identifying and hiring the best employees. The last thing they want is to lose that investment – whether it’s because a disengaged employee leaves OR because a disengaged employee stays. It’s time for organizations to create dedicated engagement strategies for their workforce. 2. allow the candidate to select the company. The talent in your organizations – the front line employees who are usually paid hourly - perform incredibly valuable work. They are often the first employees seen by the customer. They’re the seasonal or part-time employees who help the business during really busy times. Selecting, engaging and retaining an hourly workforce is critical to organizational success. And hiring hourly employees isn’t exactly the same as salaried staff recruitment. In fact, it can be harder and take more strategy. Most employers recognize that today's candidates have high standards and even higher expectations. However, some employers fail to realize that offering candidates a bad recruiting experience impacts more than just application rates and a company's ability to hire. Poor candidate experience can tarnish their company's reputation and hurt their bottom line. Join us for a 45 minute webinar with Elaine Orler, chairman and co-founder of Talent Board, founding organization of the Candidate Experience (CandE) Awards. Sharing results from the 4th Annual CandE Awards, Elaine will explore how technology impacts the job candidate experience and share how employers can incorporate technology into their recruiting strategy. Elaine will also discuss which recruiting and CRM practices helped the CandE Winners deliver a positive experience as well as offer tips to improve recruiting strategies to engage today's top talent. Though it’s tempting to treat your candidate experience as a checklist of to-dos, your efforts may be sidelined by changes in technology and user behavior. For example, you may know that it’s important to offer job seekers a mobile-optimized job search experience. But do you know how changes to Google’s mobile search results can impact job seeker traffic to your site? Join us for a 45 minute webinar with D. Mark Hornung, Senior Vice President and brand strategist at Findly, as he discusses 5 recruiting techniques that you should be doing better. Mark will share insights on job seeker habits and technology updates that will impact the effectiveness of your efforts as well as tips for adapting to these changes to vastly improve your talent acquisition plans. Join us for a 45 minute webinar with Vikram Subramaniam, EVP and General Manager at Findly, as he discusses how technological developments in ecommerce, mobile and other online innovations have influenced the recruiting process. With a wealth of experience developing key products for consumer companies like eBay and Netflix, Vikram will share why these features work and how you can implement them to improve your candidate experience. Chances are, your marketing team has perfected the use of email marketing to acquire new customers or stay in touch with existing ones. But did you know that the same tactics can help your recruiting team find new job seekers and keep existing candidates warm? Join us for a 45 minute webinar with Angela Zener, VP of Product Marketing at Findly, as she shares tips for optimizing your candidate email strategies, including automation, personalization and performance tracking. Extracting best practices from her product marketing and lead generation roles at top technology companies including SAP and LexisNexis, Angela will share strategies that marketers and recruiting professionals alike should integrate into their customer acquisition and retention plans. With the immediacy and ubiquity of social media and the changing attitudes towards work, workers encounter non-stop enticement to consider new career opportunities. This makes the challenge of recruiting, communicating your employer brand, and decreasing employee attrition virtually non-stop. Research from McKinsey and other thought leaders now allows us to map the 5 critical phases in this job seeker journey from awareness (what job seekers learn and know) to engagement (what they decide to do). Join us for a 45 minute webinar with Mark Hornung, Senior Vice President and brand strategist at Findly, as he discusses these 5 steps to employee engagement and offers tips for responding to each. Mark will share insights on trigger events that occur with increasing frequency to the all-important ZMOT (Zero Moment of Truth) as well as Active Evaluation to Commitment. Employers often rush to assemble and promote their employer brand. However, before using technology, AKA the “tools” for communicating your employer brand, first you need to develop your strategy, or the blueprints, for your company’s brand. - What (or who) are the best resources for effectively communicating your employer brand? - What are the best research best research methods for understanding how employees really feel about your brand? - What is an Employer Value Proposition and how does it impact your relationship with your employees?